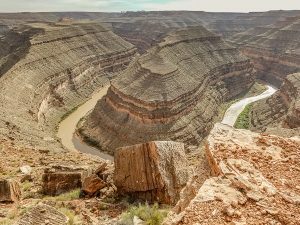 As seniors, we dry camp (no w/s hookups, no TV, no electricity) for only $5 per night at Goosenecks State Park on the rim of the San Juan River meander known as a gooseneck. The silence and darkness of this remote area at night is worth every penny. We are surprised to find a group of campers that we met last year in Moab already set up here. They are also using this park as a staging area for their next day’s journey into Moab. You are so right about having all you need before you go here! We stayed there last year and had the whole place to ourselves. It is certainly beautiful! Thanks for the memories! Holding anger is a poison. It eats you from inside. We think that hating is a weapon that attacks the person who harmed us. But hatred is a curved blade. And the harm we do, we do to ourselves.